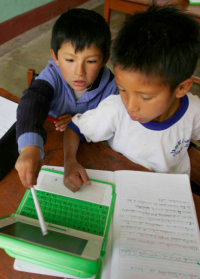 Oscar Becerra Tresierra, head of the Directorate General of Educational Technologies (Digete) of Peru's Ministry of Education, announced 100% XO laptop saturation for Peruvian school children by 2011. "He recalled that in the fourth stage of "Una laptop por niño" (OLPC by its acronym in English), the Ministry of Education issued in this year, 230.705 laptops and will encourage the teaching and learning of 718.499 million students 16.412 and 85.413 teachers in educational institutions in all departments. At the end of this stage, "one laptop per child" will be distributed for free, about 550,000 nationally modern computers, in the context of improving equity and educational quality of public school students, Oscar Becerra detailed. Laura surveyed three schools in the south of the country that were among the first in Peru to receive the laptops. He found some teachers had never been trained to help children use the computers. Peru's Ministry of Education has provided only five hours of training to some teachers, and many of the schools in the programme are in remote, rural villages, making it impossible for untrained teachers to ask for help. His survey also found that educational achievement has not improved. Student grades haven't changed and their level of knowledge was still below the national average.